NSW Govt International Video Prize at SydStart 2014.
via NSW Govt International Video Prize at SydStart 2014. Posted in Education, Government, Innovation on August 26, 2014 by Pete (@pc0). All stereotypes are wrong we can confidently predict with tongue firmly planted in cheek. 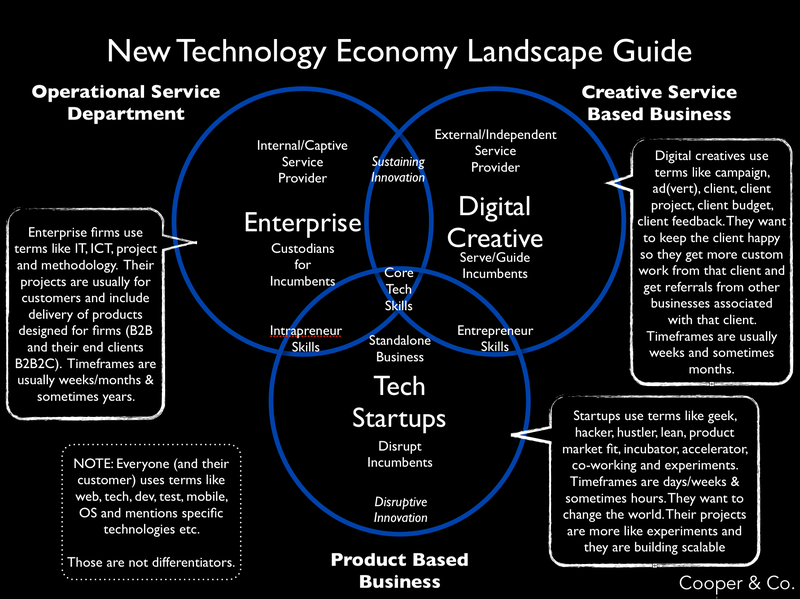 When it comes to technology industry classifications this is certainly the case but we decided to publish this New Information & Communications Technology Landscape Guide to help people understand the changes the industry is undergoing. No longer is it simply enterprise/business with their major suppliers and smaller nimble suppliers. Now the position of the major suppliers is no longer disputed, they are at the top of the stock exchange food chain and are the leading enterprises in their own right dominating markets globally. What is not clear and is consistently underestimated is the role of the digital creative (typically entertainment or ex-advertising and marketing centric and usually providing services or services bundled with a complete deliverable e.g campaign, game, movie, television advertisement – of which they only do a relatively small number each year) and the tech startups (typically disruptive innovation and product centric and since it is standardised/productised and usually internet software and software/hardware focused they are typically scalable to very large numbers). Think of the difference between ‘digital creative’ and ‘tech and tech enabled startup’ to be something like the differences between Hollywood and Silicon Valley. Or in the case of advertising perhaps New York and Silicon Valley. They both have some level of entrepreneurship and technology but the differences are stark when it comes to scale, productisation, mindset, methodologies, talent portfolio and language. To all you industry observers and commentators in all sectors, we hope you find this useful. Comments very welcome. Note: Originally published Mar 12, 2013. Revised to correct typos and add more context (language, timeframes, stakeholders). 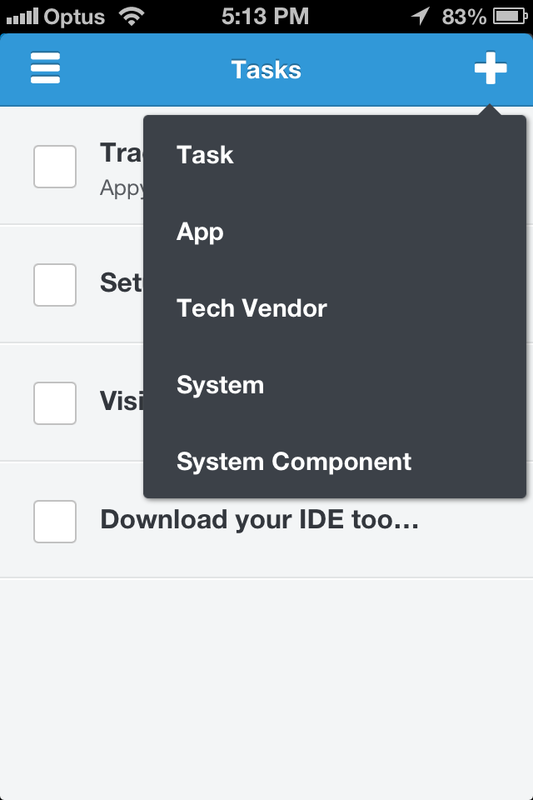 If you like this you might also be interested in how to manage it with Enpoma for Apps. 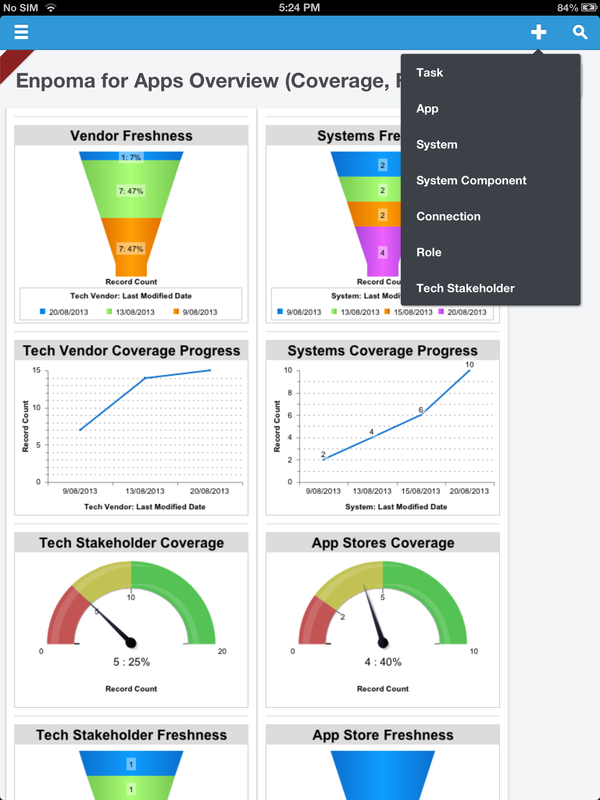 Application Portfolio Management has finally come of age and is available instantly for all large and small firms in the form of Enpoma for Apps – Enterprise Portfolio Management for everything from simple apps to complex mission critical multi-server platforms. 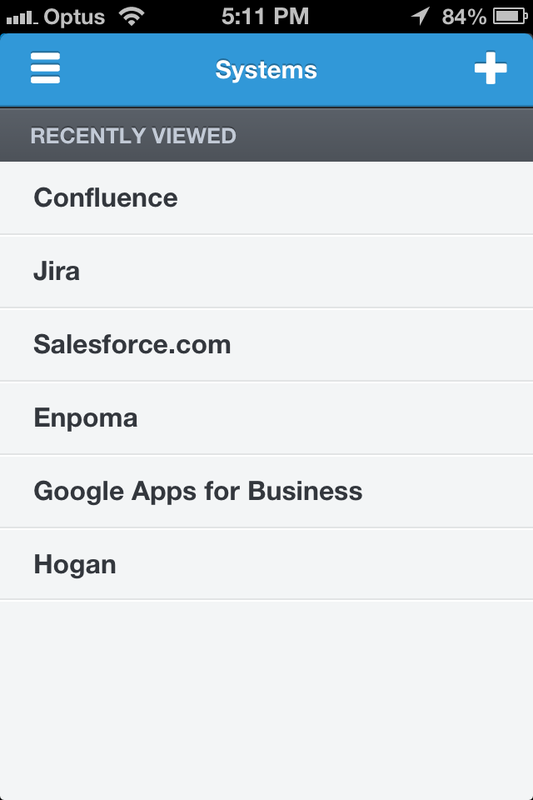 The pre-release (alpha) version of Enpoma for Apps is entering limited testing with enterprise prospects in a few countries. Some of the simpler screen shots will give you a feel for what it looks like. Enterprise Portfolio Management (EnPoMa) is a small simplified centralised approach to managing large complex distributed sets of assets. In this case we are focused on the technology and operations ecosystem assets (systems, vendors, stakeholders, responsibilities) much of which is generally referred to these days as apps even though in the enterprise world these apps may involve hundreds of servers, interfaces, people and other assets and liabilities including full stack inhouse and external components and IaaS, Paas and SaaS costing hundreds of millions of dollars. 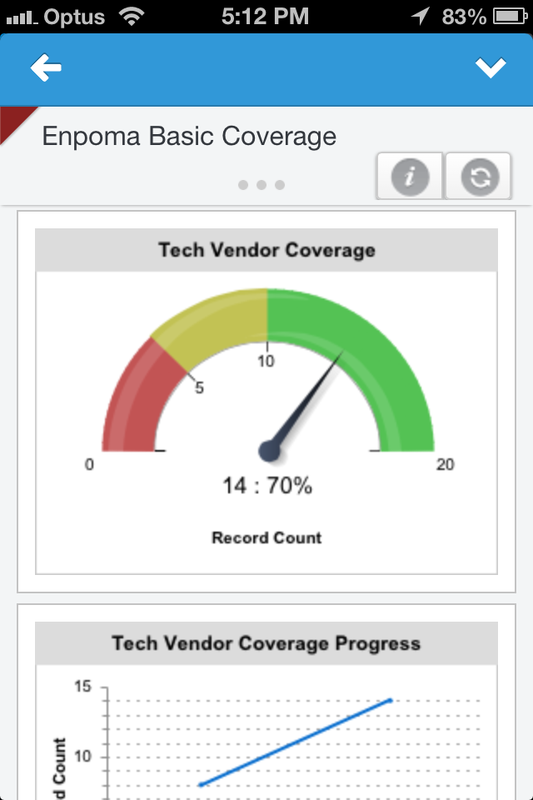 Enpoma for Apps is a mobile, tablet and web app for enterprise senior management and their direct reports helping deliver strategic insight & management of an organisation’s technology. Typically 80% of a large enterprise enterprise tech and operations s budget is spent on business as usual (i.e. keeping the lights on) the remaining is spent on pruning (decommissions/upgrades/consolidations) and innovation. The idea is to help them innovate more by better managing risks (e.g. vendor, technology, concentration, geo, skill, key person) and opportunities (consolidation, diversification, acquisition etc) and more. 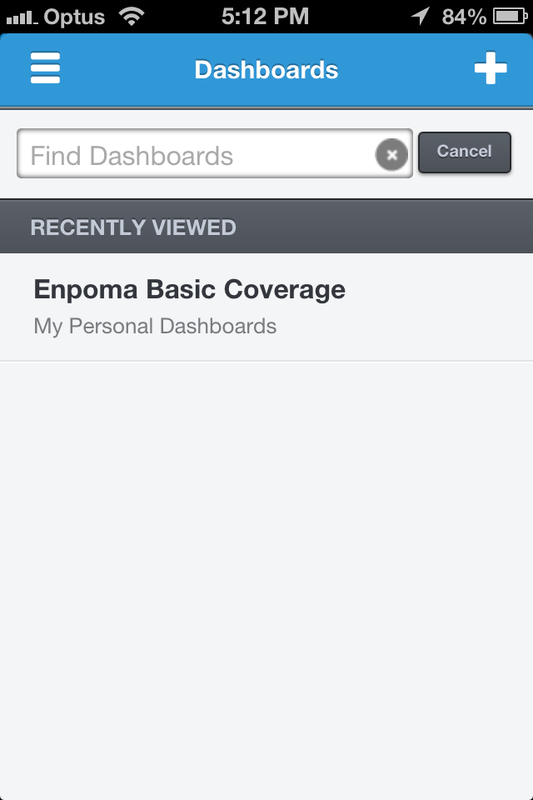 Enpoma gives you dashboards that pinpoint areas to focus on and more importantly what is not being focused on. Where you are making progress on understanding (the stages of knowing) and where you need to do more. You can read more on our earlier Enpoma product announcement. If you would like to participate in this limited release trial your firm could qualify for early access and discounts for the first year of use so please contact us using the form below. Please note that while most of our target market are likely to be larger firms, smaller technology centric firms and early adopters who want to be ‘ahead of the game’ strategically (e.g. for an upcoming investment or merger/acquisition) or who are operating a complex/diverse technology environment will also benefit. If you heard about us via a closed audience notice (e.g. professional forum or direct mail) please let us know via the comments. Posted in Enterprise, Government, Innovation, Insight, New / Featured, Platforms, Products & Services, Technology on August 13, 2013 by Pete (@pc0). I recently had this innovative communications video shared with me, it highlights the innovative and differentiated position of Sweden, with a focus on Stockholm. While some of it is little more than a gimmick, most of it is rather smart and achieves remarkable ‘cut-through’ in a time efficient manner. Innovation, sustainability and technology are three of the hottest brand value creating elements at the moment and this campaign (or perhaps ir was just one event) achieves all three. Posted in Brand, Communication, Education, Global, Government, Innovation, Inspiration, Sweden, Technology on January 30, 2013 by Pete (@pc0).